Given the striking contrasts between its upper-class buildings and hillside favelas, Rio de Janeiro is a prime example of a divided city. What effect will the Olympic Games have? Houses from a favela are photographed through the Olympic rings prior to the opening ceremony for the 2016 Summer Olympics. PAimages/Jae C Hong. All rights reserved. In the mid-1990s, amid a crisis of rampant violence in Rio de Janeiro, an influential Brazilian journalist, Zuenir Ventura, published a book with the title Cidade Partida. The expression could be translated as broken or split city, as if Rio had an integrity that contemporary violence shattered. A more apt translation is an increasingly prevalent phrase used to describe urban conditions in the United States: divided city. Given the striking contrasts between Rio de Janeiro’s upper-class buildings and hillside favelas, it is not surprising that the epithet found broad resonance. Cidade Partida challenged what was until then Rio’s most recurrent moniker, Cidade Maravilhosa—marvelous or wonderful city. Those familiar with its landscape will find explanations to be superfluous. In the 1930s, when a song about Rio titled “Marvelous City” hit the airwaves, in the 1960s when it became the city’s official anthem, and today, when crowds sing it in unison during carnival, images of Rio’s cultural and natural exuberance come to mind. But the origins of the expression betray another history. “Marvelous City” became popularized in the context of an ambitious, Paris-inspired set of urban reforms early in the twentieth century. The phrase designated a city becoming modern, whiter, and at long last, as we read often in the press from the period, “civilized.” In this scenario, a more divided city was in fact the goal, with the poor—disproportionately non-white—pushed to the outskirts or incipient favelas, as far as possible from central areas and from view. Led by then-mayor Francisco Pereira Passos, the reforms resulted in the eviction of one-tenth of the city center’s residents. To be sure, part of the goal of the reforms was to remedy a reputation Rio had earned as a “city of death” or “foreigner’s grave,” due to the prevalence of diseases like yellow fever. The Zika virus, in this regard, produces an unmistakable echo of the past. But the notion of the marvelous city of the belle époque as the privilege of a few remained clear to many. The manifesto of a labor group in 1929 mocks the use of the epithet by “literary fops,” drawing attention instead to the dire living conditions of the working classes. Rio once had the largest urban slave population in the Americas, and the presence of their descendants in major public spaces presented an embarrassment to governing elites. In the belle époque, World’s Fairs and Expos proliferated, and major cities served as arenas where empires and nation states could compete. Not coincidentally, the modern Olympics began in 1896 in Athens, amid this era of proliferating precursors to today’s mega-events. Rio de Janeiro at the start of the twentieth century was the third major port of the Americas, behind New York and Buenos Aires, and the capital of a newfound republic, proclaimed in 1889. The city’s compact colonial fabric, marked by varied and jumbled street life, did not befit national ambitions. The Pereira Passos interventions sought to give an urban form to the positivist ideals of “order and progress,” enshrined in the Brazilian flag. In practice, Rio de Janeiro was to be considered marvelous when undesirables were not around. A divided city was, in fact, a desired outcome of the reforms. In the 1990s, Ventura wrote his Divided City in the aftermath of a massacre, when off-duty policemen killed twenty one people in one of Rio’s poorer peripheral neighborhoods. He spent months in this community to write a book that was bold for exposing Rio’s divisions, or the inner workings of drug traffickers and corrupt police forces, but also for an insistence on valuing the city’s imperiled traditions of circulation and cultural exchanges. Since then, far-reaching infrastructure investments have favored favelas, and in Brazil, major redistributionist policies were implemented without stirring the sort of ethnic animus that we find elsewhere (though there are many discouraging signs). After emerging from a long military dictatorship (1964–85), Brazil appeared to be in an ascendant trajectory, even as its former capital and most visible city lagged behind. In 2007, winning the hosting rights to the 2014 World Cup signaled Brazil’s emergence on the global stage, validated by a relatively successful weathering of the 2007–08 financial crisis. In October 2009, Rio de Janeiro’s election as the first South American host to the Olympics meant that the city’s time had also come. The announcement was received with jubilation. Then-president Luiz Inácio Lula da Silva declared: “Today I’ve felt prouder of being Brazilian than on any other day.” Rio’s mayor Eduardo Paes, who assumed office in the beginning of 2009 and was reelected to a second term (2012–16), often speaks of the Olympics in terms of the legacies that it will leave behind. He has framed himself in the tradition of Pereira Passos. Under the Paes administration, as Rio experienced some of the most consequential changes since its foundation in 1565, new officially sanctioned epithets have been proposed. Porto Maravilha, “Marvelous Port,” evokes the marvelous city trope to designate the ambitious revitalization of the port area. Cidade Integrada, “Integrated City,” sought to push back against the divided city moniker. Ultimately, Rio’s government settled on Cidade Olímpica, or “Olympic City.” The Games arrive, however, amid a climate of general disillusionment and concern with Brazil’s prospects. In some ways, this represents a widespread shift over the past few years in perceptions of how wise it is to host mega-events. Given scandalous cost overruns, broken promises, and white elephants after recent Olympics and World Cups, this is not surprising. But Rio’s experiments with mega-event and Olympic urbanism need to be understood in their particular contexts. At the same time, the interventions connected to the Games and the missed opportunities in the lead-up to them should pertain to all those concerned with urban futures, and with how we can build more democratic societies. Between the early-twentieth-century ideal of a Paris in the tropics and the drug war–fueled violence of the 1990s, quite a few changes occurred. In some ways they set Rio apart in its current condition as a divided city—and as an Olympic city. In a nutshell, during the 1920s and ’30s the thinking in Brazil departed from a broad Western consensus over scientific racism, including an obsession with notions of purity and the belief that miscegenation leads to degeneracy. In a country as ethnically mixed as Brazil, it is easy to understand how these ideas might be an inconvenience. Over time, the image of Brazil as a land of racial harmony became propagated, and sociocultural as well as political discourses increasingly posited mixture as a desirable feature. Initially marginalized expressions, like samba music, originating in some of Rio’s most diverse quarters, became dominant and emblematic of nationhood. Echoes of this cultural history pervade the repertoire through which Rio has been presented to the world, including as an Olympic City. Any serious observer of twentieth-century Rio (or Brazil) sooner or later confronts the question of how a culture and self-image so marked by mixture coexists with stark socioeconomic disparities. As it happens, in interwar Rio a contradictory development coincided with newfound ideas about Brazilian society as mixed and inclusive. In an early and audacious embrace of tenets of modern urbanism, planning and governance became increasingly intent on segregating urban spaces. Sociocultural paradigms and urban development went in opposite directions: the country became broadly accepted and even celebrated as mixed, but city planning further sought to divide and stratify. 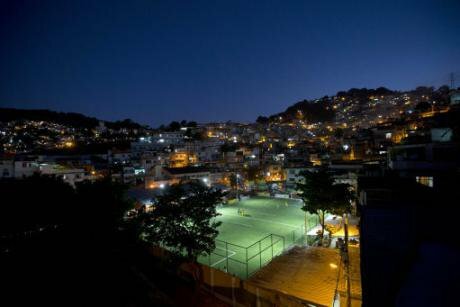 Football pitch in the Morro da Mineira favela. Paimages/Silvia Izquierdo. All rights reserved. This at once vastly unequal but vibrant and diverse Rio could be deemed a porous city, a descriptor that disrupts established narratives perpetuating either the flattened notion of a divided city, or the myth of a harmonious, multiracial “marvelous city.” Despite its inequalities, Rio’s cultural history has been shaped by fluid boundaries and encounters across class and race. It is important to remember this past—still present in various popular practices—as the legacies of olympic urbanism risk rendering Rio’s porosity more outmoded than ever. Foregrounding Rio within a hemispheric perspective might help to press the point. Rio diverges from other major cities of the Americas for a lack of exclusivist ethnic neighborhoods. After the 1930s, for example, one of Rio’s public squares became known simultaneously as the epicenter of a Jewish neighborhood and as a “Little Africa.” It was actually located in an area where whites remained the majority. There was never anything in Rio quite like what occurred in cities of the United States during the twentieth century. No Jim Crow laws, redlining, blockbusting, or white flight. Favelas, historically represented as black, have in fact always been multiracial. According to data from 2010 census, in the least white area of the city, Mangueira, less than a third of residents self-declare as black; citywide, around 11.5% self-declared as black, 36.5% as pardo (mixed or gray-brown), 51.2% as white. And yet, to anyone familiar with this former capital of a country where slavery lasted until 1888, occurrences like those leading to renewed antiracism movements in the United States present all-too-familiar patterns: racialized police brutality and murder, along with institutionalized inequities that seem to render racism as blunt as it is redundant. Maps showing race by household in beachfront neighborhoods of Rio might not display the sharp dividing lines found in St. Louis, Missouri, or even in São Paulo, and on a hot day, the bodies behind census dots might converge on the beach, regardless of color. But it is not that inequality in Rio manifests itself more as a Pollock painting than a Mondrian. It is more that, whereas poverty is multiracial, the wealthiest city blocks are nearly entirely occupied by white residents. Nonetheless, even with residential segregation, the presence of largely unplanned but shared multiethnic spaces like beaches, dancehalls, sidewalks, and stadiums have been vital to Rio’s rich culture. It is this legacy that is put in jeopardy by Olympic urbanism. In the 1920s and ’30s, pioneering urban plans proposed strict zoning laws and near-absolute social segregation, with the circulation of automobiles as a guiding concern. In the 1940s, the neighborhood that brought together Rio’s Little Africa and Jewish quarter was razed for the construction of a monumental avenue. Between the 1950s and ’80s, like other major Latin American cities but unlike so many in the United States, Rio’s population kept growing. A series of elevated highways privileged the increasingly affluent beachside South Zone, adversely affecting suburban neighborhoods. New transportation networks facilitating access to the downtown coupled with legislation against residential uses in central areas led to a more sprawling and uneven city. As Rio became less compact, spatial segregation grew. The 1960s and ’70s were marked by “removals,” under a military dictatorship, when the state razed several favelas located in prime real estate areas, forcibly relocating residents to housing projects in the peripheries. The estimated population living in favelas grew from around 10% of a city of 3.2 million in the 1960s to almost 20% of a city of 5.8 million in 2000. Since the 1980s, as Brazil haltingly adjusts to democracy, contradictions between the rhetoric of inclusion and practices of exclusion have remained in place. In a porous city, stratification does not preclude fluid boundaries. But in a growing metropolitan region with upwards of 12 million inhabitants, no measure of cultural cohesion could sufficiently reconcile deep inequities with democratic life. The official “Integrated City” epithet, which never caught on, was doubtlessly well-intentioned. And there is a case to be made for new mobility infrastructure—namely, a metro extension, and highways with Bus Rapid Transit (BRT) lines—leading to a more integrated city. Yet in this case, anyone would be hard-pressed to argue that such investments also lead to a more inclusive city. More integrated in terms of mass transit, perhaps, but with unprecedented segregation. There are at least three main clusters of developments connected to the Olympics. The ambitious reforms in the historic port area have included the removal of an elevated highway that stood between the city and the bay, as well as the addition of tram lines connecting the port area to the center. A new Museum of Tomorrow (Museu do Amanhã) designed by Spanish Santiago Calatrava opened in late 2015. The original plans for the Olympics did not contemplate this long-neglected region in significant ways, and although these developments have become associated with preparations for the Games, they are marginal to it. Aspects of these reforms might deserve praise, but they included forced removals and have generated justified fears of gentrification (and further relocations). 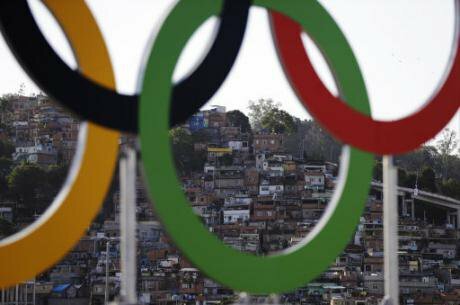 North of the center, the Maracanã stadium will host the opening ceremonies, and several events will be held in the neighborhood of Deodoro, technically already in Rio’s West Zone. Deodoro is in a usually overlooked part of the city, of low to middle income residents and pockets of poverty. Facilities built to host Olympic events have been converted into a new public park (Parque Radical). Deodoro will be connected by the Transolímpica expressway to the wealthier West Zone neighborhood of Barra da Tijuca, the focal point of the Olympics. The fifteen-mile route, covered by exclusive BRT bus lanes, is supposed to reduce to around twenty minutes a trip that might have taken two to three hours in the past. The bulk of the investments related to the Games, in fact, has been directed to Barra da Tijuca, and to a newly developed area being deemed Barra Olímpica. Even though the Olympic Park and the majority of events are located there, the scale of accompanying developments has remained surprisingly under the radar. This might constitute the most consequential spatial reorganization in the city’s history. Barra da Tijuca’s development, parallel to the beachfront, began in the 1970s. It now has over 300,000 residents in an area larger than Miami, a city to which it is sometimes compared. Barra’s symbolic boundaries have expanded with Rio’s Olympic urbanism, as adjoining territories—further inland—repeat its exclusionary patterns of development: several square miles are now covered by high-rise condominium towers with fenced-in open spaces. Car-dependent and sprawling, this represents a more environmentally predatory urbanization model than Rio’s traditional compact neighborhoods. Many will recognize patterns of real estate developers currying favors through campaign donations, insider dealings, and billions of infrastructure investment, where costs are incurred by the public, but profits are private. The disproportionate investment in the East-West axis, parallel to the waterfront, conforms to an elitist vision of Rio’s future that harkens back to the Pereira Passos reforms of over a century ago. A competing vector, dating to the city’s beginnings, structures Rio’s development along a South-North vector, around as well as across the Guanabara Bay. This is reflected in a metropolitan region of over 12 million people, whereas the municipality’s population is around 6.5 million. Rio’s official limits are oriented along an East-West axis, shaped by water and a mountain chain. Here, structural conditions conspired against the best interests of the population. From City Hall’s perspective, after all, there were evidently more incentives in keeping investments within municipal boundaries, rather than where they were most needed. The spatial logic of investments here reflects a challenge of contemporary urbanism, where we often have a mismatch between “the city proper” and the lived city. The notion of Olympic urbanism might bring to mind takedowns of “Olympian” urbanists and planners, sketching out grand designs from a removed distance, in god-like fashion. The intention here is not to reiterate familiar critiques of top-down planning. In fact, some urbanists proposed more democratic visions for the city. But in Rio, as elsewhere in the world, urban planners and designers are hardly the driving force behind development. The sense that Olympic urbanism implies an Olympian attitude nonetheless remains. It is just that rather than planners calling the shots, decisions more likely reflect the collusion between a few government officials and big players in real estate. The main beneficiaries of Rio de Janeiro’s Olympic urbanism have been real estate developers. In particular, the vision of Barra Olímpica as limited to the rich has been made abundantly clear in one developer’s declarations to the press. After the Games end - and postcard images of Rio de Janeiro as the Marvelous City stop gracing television screens everywhere - what will remain? Besides a new epithet with limited popular appeal, how will Olympic urbanism transform Rio de Janeiro’s future? In Rio, as elsewhere, socioeconomic divisions often reflect spatially, in the built environment, as a result of concerted efforts. The city might continue to be a fascinating case study and laboratory for how mobility and segregation can coexist, and for how mixture or cultural inclusion can abet other forms of exclusion. Rio’s past can continue to inform our present, but it seems like the city is becoming more divided in unprecedented, and yet, unfortunately familiar ways. * Adapted from the introduction to Occupy All Streets: Olympic Urbanism and Contested Futures in Rio de Janeiro.